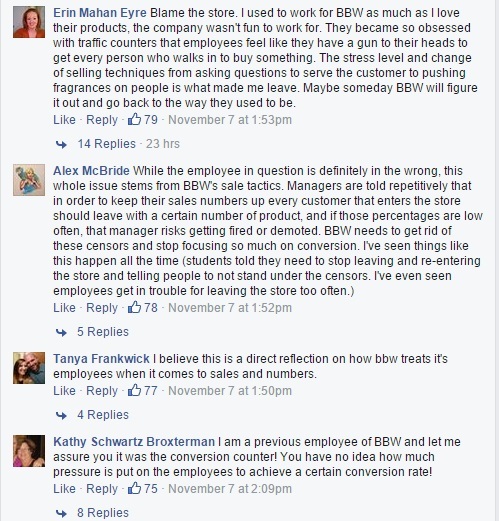 This story went viral very quickly, and highlights some of Bath and Body Works’ operational procedures that landed them in some hot water with the special needs community. To sum it up, a group of special needs students was participating in a project that entailed visiting stores to learn skills related to shopping, purchasing, and other life necessities. All was well until they visited the Bath & Body works store, at which time they were not allowed entry. Why? Because the manager assumed that they were not going to make a purchase, and explained that by entering without making a purchase, the store’s “numbers” would be off, so they could not enter. The fact that it happened to a group of special needs students made this a much more emotional story, as it appeared that the manager was making assumptions that were very wrong to make – would the manager have stopped other teenagers in the same manner, assuming because they were teens that they wouldn’t make a purchase? Or what about a mom whose toddler or young child wandered into the store because they like smelling the different products? Would they have been asked to leave, since it may have been “clear” that they were there to browse, not shop? Peeling away the details a bit, it struck me that this stemmed from a simple operational metric that must be vital to a manager’s success at this retailer – the number of customers who enter versus the number of purchases made. This is well known as a conversion counter or traffic sensor. It’s a pretty typical standard, but one that must be so heavily emphasized within this company that it causes situations like this happen. Of course, this is reflective of one manager at one of their retail locations, and may not be indicative of the retailer as a whole. However, this story was eerily reminiscent of the Comcast story that broke several months ago – when companies focus so much on one metric or training goal, the basics of customer service get lost by employees who, for whatever reason, take it to the extreme. In this case, the manager could have been facing poor numbers and was recently talked to by regional managers. Maybe the manager was close to a bonus (or being let go) and took things to the extreme. We’ll never know, but by relying on the success of the store based on this metric AND double teaming it with discrimination, it led to an ugly situation for the company. A good lesson for businesses – metrics are important and useful to pinpoint strengths and challenges, and to ensure employees are meeting operational standards. However, they should never be presented as a “do or die” to the success of a location – it could end up hurting the company in the long run.